TAMPA, Fla. February 20, 2018 – IT Authorities, announced today that CRN®, a brand of The Channel Company, has named IT Authorities to its 2018 Managed Service Provider (MSP) 500 list. This annual list recognizes North American solution providers with cutting-edge approaches to delivering managed services. Their offerings help companies navigate the complex and ever-changing landscape of IT, improve operational efficiencies, and maximize their return on IT investments. “IT Authorities is honored to be named in CRN’s Managed Service Provider list again this year. I thank our customers for the opportunity to support the mission critical mission applications that enable their business”, said Phil LaForge, CEO of IT Authorities. 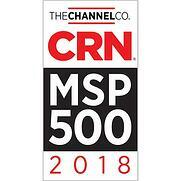 “Every IT Authorities’ team member plays an integral part in delivering our Cloud and Application Managed Services and we thank CRN for recognizing IT Authorities so prominently on the CRN MSP 500 list."